It’s a very rare thing when a beautiful, complex and emotionally stirring new musical comes along. Usually, such things hit one or two of the marks well. 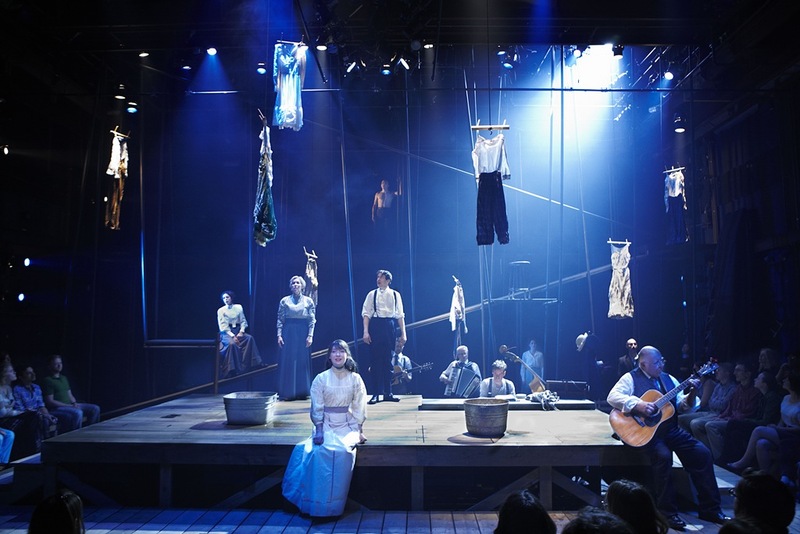 But with Eastland, which uses a widely overlooked tragedy involving the capsizing of the SS Eastland in the Chicago River as a jumping off point (no pun intended), writers Andrew White (book), Andre Pluess (music) and Ben Sussman (lyrics) make a landmark debut in a soul-shattering production at Lookingglass Theatre that finally gives a voice to these unsung everyday heroes. Overshadowed by the sinking of the grand ship Titanic three years prior, the SS Eastland’s freakish accident in 1915 is every bit as harrowing, if not as, well, overtly fascinating. Yes, the Titanic was a marvel of failed modern engineering that resulted in the death of dignitaries, socialites and the like after careening into an iceberg, while the SS Eastland, a much smaller ship, unceremoniously tipped over in the muddy Chicago river primarily due to overcrowding, spilling hundreds of passengers, almost entirely working class families, into the dark waters. The production looks just beautiful.